(CNN) -- Jose Mourinho has admitted he was left angered by the decision to sell Zlatan Ibrahimovic to Barcelona, although the Inter Milan coach reveals he is delighted to welcome Samuel Eto'o to the San Siro. Jose Mourinho believes Inter Milan have done good business in selling Zlatan Ibrahimovic to Barcelona. Inter are on the verge of completing a deal which will see them receive 45 million euros ($64m) plus Eto'o for Ibrahimovic after both players agreed terms with their prospective clubs. Mourinho knows it will be a blow to lose last year's leading goalscorer in Serie A but, speaking about the deal for the first time, admitted it is a fantastic bit of business. "I was a bit angry because no coach is happy to lose Ibrahimovic," the Portuguese told Sky Italia. "But no one is not happy to have Eto'o -- we have lost a top player but we have taken another one. If I talk as a coach and a man on the pitch, I say that I don't want to lose this player. If I talk as a manager, I say that Inter have done great business," added Mourinho. 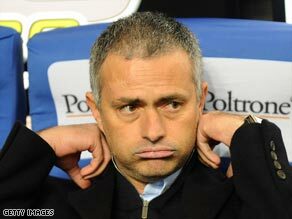 Mourinho feels Ibrahimovic will adapt to life at the Nou Camp in no time but insists he would not make a similar move. "He had this dream and wanted to go," added the Nerazzurri coach. "He told me he would miss me and I told him exactly the same thing. He's going to a club in which I worked for four years, Barcelona are an extraordinary club and he will be happy. "I didn't give him any advice but I spoke to him a few days before the final decision. I told him that if he wins the Champions League with Barcelona he won't be doing anything extraordinary, seeing as they have won it twice in three years. I like doing something extraordinary, not what's normal."